This book analyzes how women in the United States perceive the threat of crime and violence in their everyday lives and how that perception controls their behavior. Using focus groups and in-depth interviews with one hundred and forty African American, Latina, and white women of varying ages and socio-economic backgrounds, Esther Madriz analyzes the damage that fear can wreak on women's lives. Although anxiety about crime affects virtually every woman, race and class position play a role in a woman's sense of vulnerability. Latina women are in an especially vulnerable situation; many of them are immigrants, some are undocumented and have difficulties with the English language, and their cries for help are often unheard by police. Those women who are at the bottom of the social hierarchy experience an increased sense of awareness about crime. A few women learn how to use strategies of resistance to neutralize their fears. Black and Latina teenagers, for whom crime is an everyday reality, have developed coping mechanisms to deal with their anxieties. They are the "bad girls" who challenge the rules of behavior imposed upon women: stay inside, don't go out at night, always be accompanied by a man. "Good women" obey these rules to avoid becoming a victim. By "policing" themselves, women construct a limited world that leads to positions of greater subordination. Fear of crime is a strong element in keeping women in self-limiting social positions and reproducing class and race inequalities. Madriz examines relationships between fear of crime and sexual harassment, intimate violence, and the social construction of victim and perpetrator. Fear of crime has resulted in demands for law and order policies throughout the country, and racialized and class based images of criminals and victims are related to the increased demand for tough laws, longer sentencing, and to the general climate of economic uncertainty. Madriz concludes that fear of crime violates women's rights to the use of public space and limits women's choices concerning jobs, schools, leisure activities, and opportunities for advancement. Considering the enormous attention given to crime today and the large amount of funds invested in controlling crime, Madriz's informative study is especially timely. This is a compelling analysis of how women in the United States perceive the threat of crime in their everyday lives and how that perception controls their behavior. 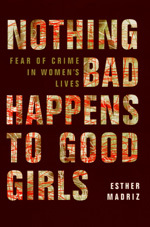 Esther Madriz draws on focus groups and in-depth interviews to show the damage that fear can wreak on women of different ages and socioeconomic backgrounds. Although anxiety about crime affects virtually every woman, Madriz shows that race and class position play a role in a woman's sense of vulnerability. Fear of crime has resulted in public demand for stronger and more repressive policies throughout the country. As funds for social programs are cut, Madriz points out, those for more prisons and police are on the increase. She also illustrates how media images of victims—"good" victims aren't culpable, "bad" victims invite trouble—and a tough political stance toward criminals are linked to a general climate of economic uncertainty and conservatism. Madriz argues that fear itself is a strong element in keeping women in subservient and self-limiting social positions. "Policing" themselves, they construct a restricted world that leads to positions of even greater subordination: Being a woman means being vulnerable. Considering the enormous attention given to crime today, including victims' rights and use of public funds, Madriz's informative study is especially timely. Esther Madriz teaches in the Sociology Department at the University of San Francisco.